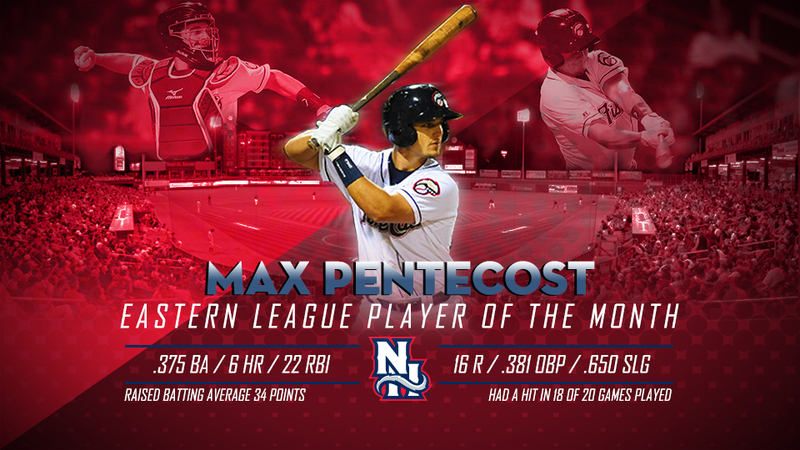 Manchester, NH - The Eastern League has announced that New Hampshire Fisher Cats (Toronto Blue Jays Double-A affiliate) C Max Pentecost has been voted Eastern League Player of the Month for August. Pentecost is the third Player of the Month award winner in the Fisher Cats 15-year history, joining 3B Vladimir Guerrero Jr. (2018) and LHP Gustavo Chacin (2004). The 25-year-old from Winder, Georgia led the league in slugging percentage (.650) last month, while ranking second in batting average (.375), second in OPS (1.031), fourth in homers (6), and fifth in RBIs (22). Pentecost had hits in 18 of 20 games, including nine mult-hit performances. In a year of big moments, broken records, and top prospects, Pentecost provided the biggest swing of the season on August 25. Trailing Binghamton 7-6 in the bottom of the eighth inning, he blasted a go-ahead three-run homer over the right field fence, and the Fisher Cats clinched their first playoff berth since 2011 three outs later. The Blue Jays selected Pentecost with the 11th overall pick in the 2014 draft out Kennesaw State University. In his first Double-A season, he hit .253 with 10 home runs, 52 RBIs, and ranked second in the league by throwing out 39.7 percent of would-be base stealers. The Fisher Cats open the postseason at home on Wednesday against the Trenton Thunder (Yankees) at 6:35 p.m. The first two games of the best-of-five Eastern Division Championship Series will be played at Northeast Delta Dental Stadium with the second game scheduled for 6:35 p.m. on Thursday. Tickets are available at nhfishercats.com or over the phone at (603) 641-2005. For media requests, please contact Tyler Murray (tmurray@nhfishercats.com).